Automobiles assembled in Mexico are exported throughout the globe. 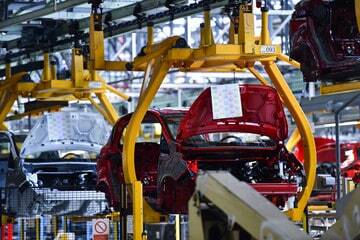 Today there is an impressive diversity of automobiles manufactured in Mexico. Mexico’s success in this sector is the product of its able workforce, favorable geographic position and the free trade agreements that govern its commerce with forty-four nations. Although automobiles manufactured in Mexico are mainly done so in volume, the country also produces shorter runs of premium vehicles. Mexico exports more units of the Jeep Compass than are consumed in its domestic market. The SUV is assembled at the Fiat Chrysler plant in Toluca. Toluca is a city in Mexico State. Twenty-two thousand five hundred vehicles are produced per month. In addition to its main export market of the United States, Mexica-made Jeep Compasses are also shipped to Italy and Canada. Additionally, this model shares a production line with other Fiat Chrysler consortium models. These automobiles manufactured in Mexico are the Fiat 500 and the Dodge Journey. Both vehicles are destined for sale in North America and in Europe. The Mexican-made Jeep Compass has a four-cylinder gas engine, 180 horsepower, nine-speed automatic transmission with 4×2 and 4×4 traction. The Ingolstadt, Germany-based Audi was one of the first companies to produce luxury automobiles manufactured in Mexico. Later both BMW and Mercedes-Benz followed Audi’s lead. The company has been producing one of its relevant and sought-after vehicles, the Q5 SUV, for two years. In addition to its standing as a leading domestically consumed brand and model, the Nissan Sentra is the vehicle that is most exported from Mexico to the world. To be able to produce the required volume of Nissan Sentra automobiles manufactured in Mexico the company employs two manufacturing facilities in the state of Aguascalientes. These two factories account for the manufacture of 230,000 units per year. The popular Equinox is also among the popular automobiles manufactured in Mexico. This model was initially assembled at the General Motors plant located in San Luis Potosi., but its production was shifted to its Ramos Arizpe plant to make room for the assembly of the GMC Terrain. SUVs have not only become popular for consumption in the Mexican market but have also come to be a dominant part of the market of automobiles manufactured in Mexico. The vehicle is being built in the new US $1 billion plant that is located in Aguascalientes. Company officials have recognized that having a North American source for the production of the QX50 speeds the communication of orders between retail and the factory. A new face of automobiles manufactured in Mexico was seen when Korean auto producer, KIA motors, opened a plant in Mexico’s industrial capitol, Monterrey, Nuevo Leon. Company officials tout the plant as being “the most advanced car assembly facility in the world.” In 2017 the company produced 223,000 of its Forte, Rio and Hyundai Accent models. The company is drastically reducing its dependence on sales in the North American market by exporting KIA automobiles manufactured in Mexico to such Latin American countries as Chile, Colombia, Peru, Paraguay, Uruguay, Costa Rica, Panama, Honduras, Nicaragua, and Honduras. The company’s Mexican manufactured Rio model will reach export markets in Sudan, Tunisia, Liberia, Somalia, Laos, and Belize. Three years after beginning production in Mexico, the company has been able to gain 6.7% market share. KIA is working diligently to increase this number.